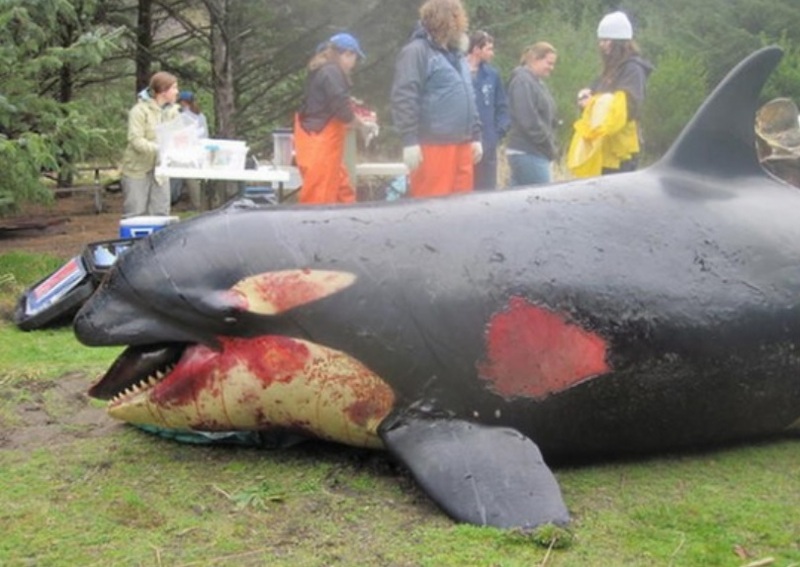 Ken maintains that an underwater “blast” remains the mostly likely cause of death for the whale, who was known as Sooke — or Victoria, as Ken originally named her. The comment period closes on April 15 for the Navy’s Proposed Actions in the Puget Sound.and the entire Northwest Training Complex.The Navy plans to add pier-side testing and maintenance, increased sonar practicing, and increased underwater charges and mines. While the Navy tries to minimize the impact of their activities Ken Balcomb senior scientist at The Center For Whale Research has actually heard, and seen the damage. Please follow this link and read the Navy’s Proposed Plan HERE. Once you have read the proposed action you can then comment on the three deadly and important changes they are seeking. The ability to do pier-side sonar testing and maintenance one of the worst. 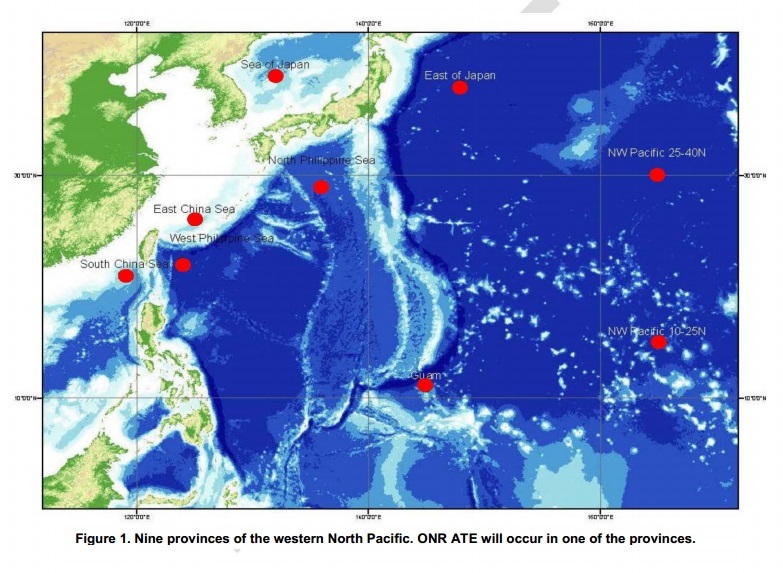 An increase in sonar, and mines exercises and increase in underwater charges is unacceptable! 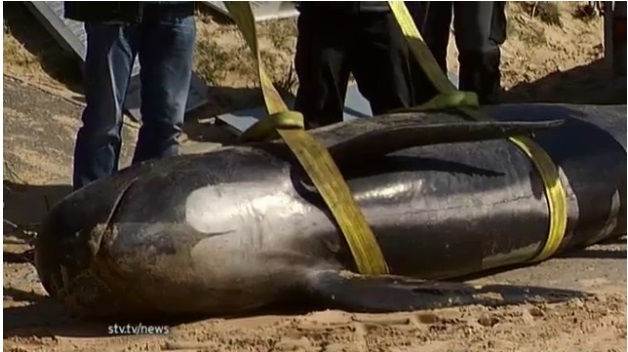 Last week, I wrote about a mass stranding of beaked whales off Crete while the Greek, U.S., and Israeli navies ran exercises offshore – the latest in a long line of whale strandings associated with naval training. At the time somewhere between five and eight whales were known to have beached along 20.6 kilometers of coastline west of Ierapetra. “I am writing in opposition to the Navy’s proposed expansion of their Northwest Training Complex. I want to begin by opposing pier side sonar testing that would take place in an ESA listed habitat for resident orcas not to mention the many other cetaceans, marine mammals, and ocean life living close to the shorelines. Increasing these tests dock side is out of the question. There is no limit to the damage and deaths it will cause. I also oppose and increase in underwater charges, increased war games using sonar, and explosion of underwater mines. “Use of new and existing unmanned vehicles and their acoustic sensors, in support of homeland security and anti-terrorism/force protection. 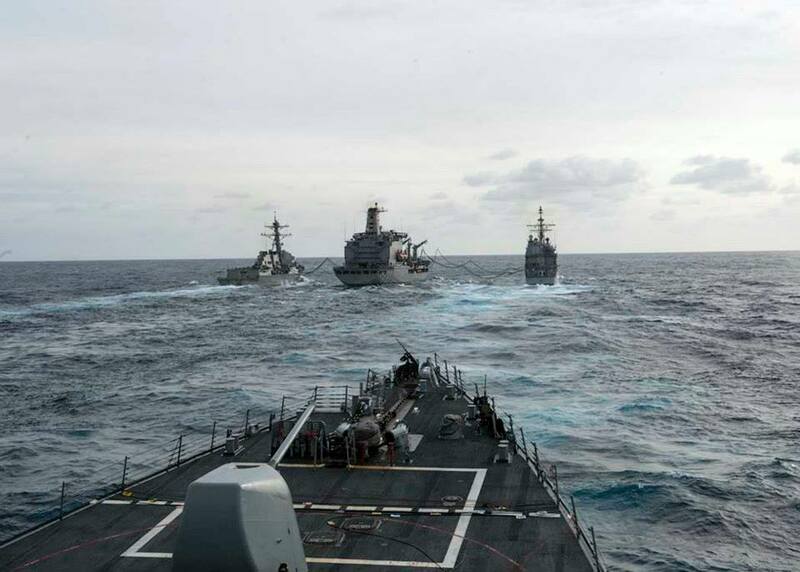 This type of training is critical in protecting the nation’s military and civilian harbors, ports and shipping lanes. Use of 0.50-caliber blanks in Puget Sound in support of force protection training of the Navy’s Maritime Expeditionary Security Force. Addition of a biennial maritime homeland defense mine countermeasure training exercise in Puget Sound and analyzing the amount of time acoustic sensors are used during that event”. All of the above expansions are unacceptable. I am supporting NO ACTION ALTERNATIVE and a slow departure of the Navy from the Puget Sound area and Pacific Northwest. It’s time to end the Navy’s war on whales”. Please use the above information and compose your comment now opposing the Navy’s proposed action increasing their deadly activities in the Puget Sound! 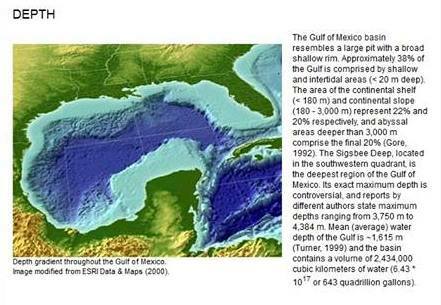 Many people are wondering why and how these deep water whales stranded on the shallow shelf of the Gulf Basin with some whales more compromised than others. 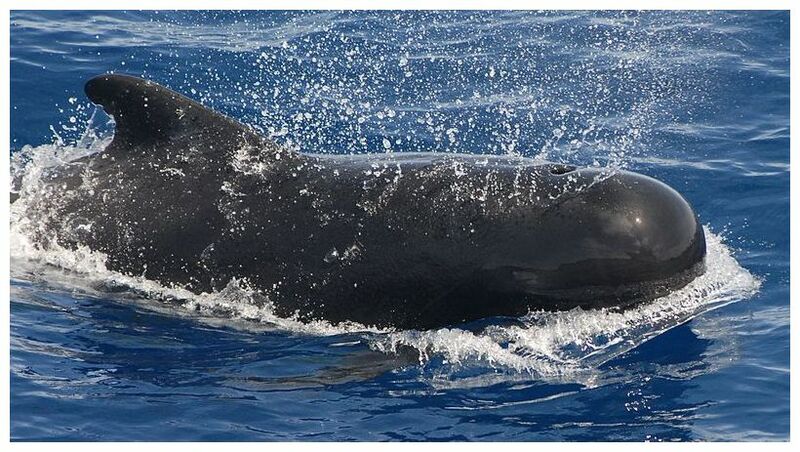 Pilot whales are known to be deep divers that stay far from shallow waters: “They feed primarily on squid, but they may also feed on octopus and fish, all from moderately deep water of 1000 feet (305 m) or more. 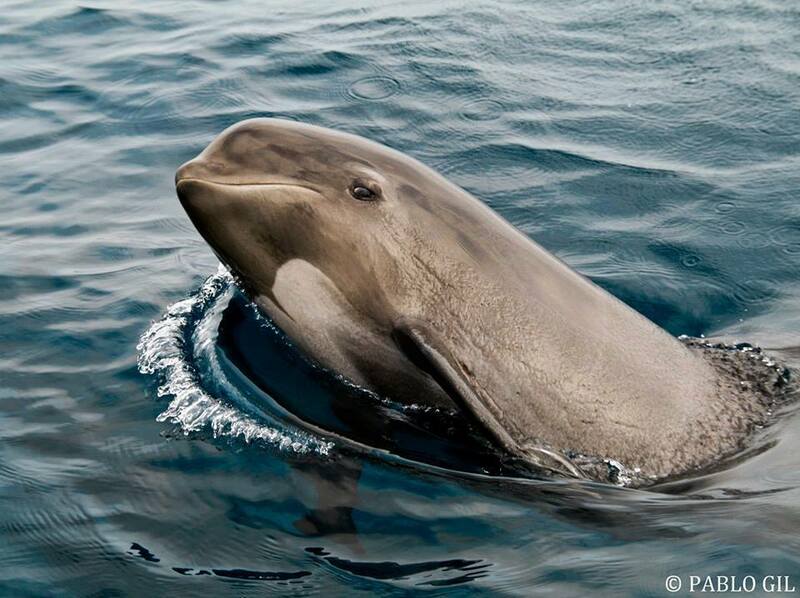 When they are swimming and probably looking for food, pilot whales form ranks that can be over a kilometer (more than 1/2 mile) long”. (source) When one is sick the others will often follow but the question still remains as to what caused this stranding and terrible suffering and loss of cetacean life? 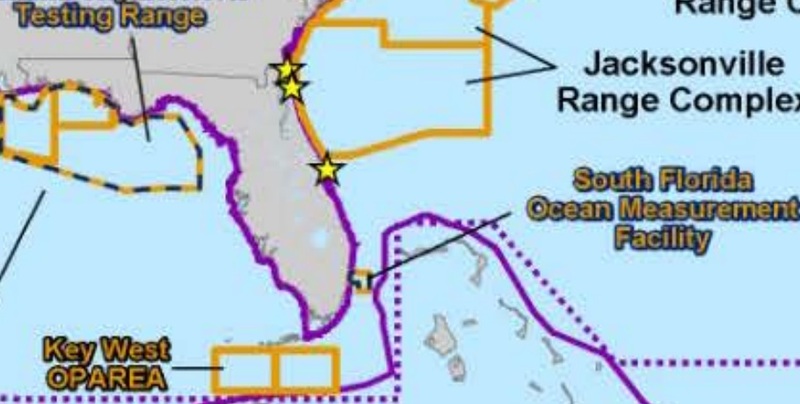 “Commander, Strike Force Training Atlantic (CSFTL) is evaluating CSG2 on how well they perform during simulated surface and sub-surface threats and ship movements such as transiting a strait in hostile waters. 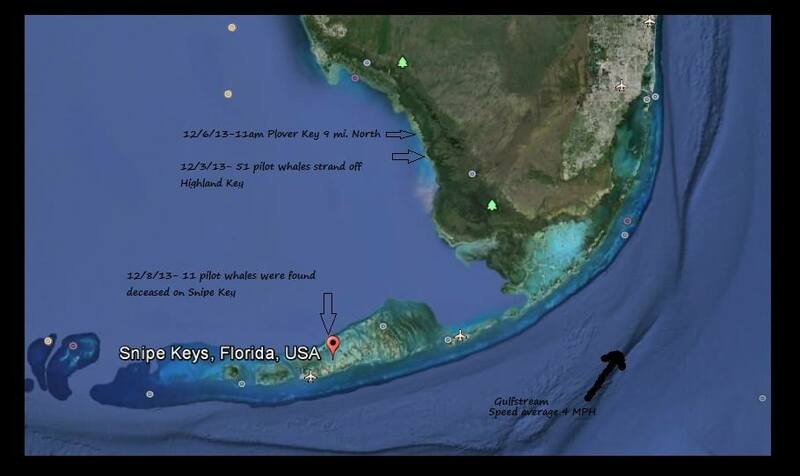 While NOAA suggests mobilivirus as the cause of the pilot whale strandings ocean activists are questioning as to why the Bush Strike Group Comptuex exercises December 2nd through 8th have not been mentioned. 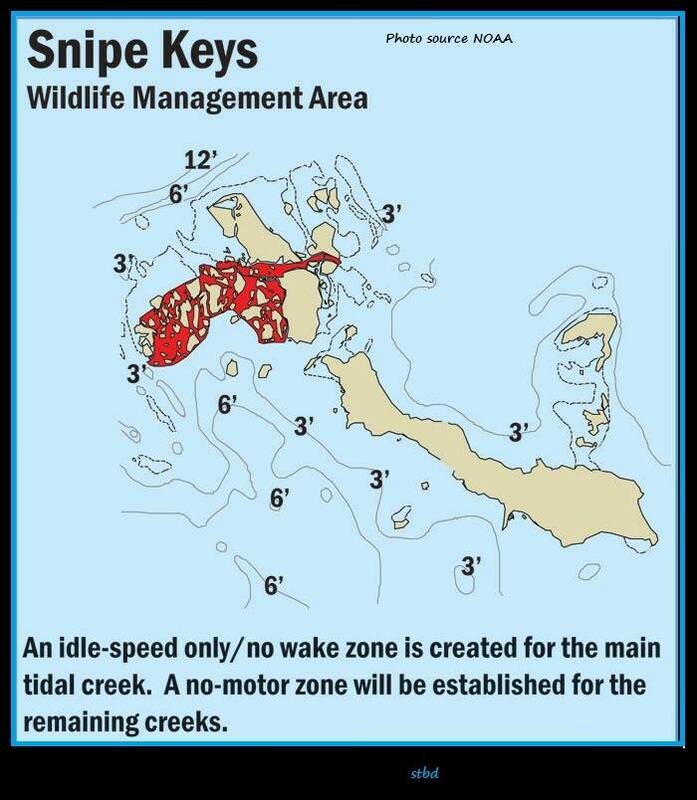 Considering the location of the pilot whales strandings to OPAREA an area designated for Special Use Airspace and other activities this seems negligent. The Navy has been given what many are calling an excessive number of takes, ” “The Navy estimates it will harm marine mammals over 33 million times in the next five years”(source) Despite public outcry NOAA/NMFS have gone ahead and given the Navy a Letter of Authorization to increase the harm caused to Marine Mammals using archaic mitigation measures such as “look outs,” people looking at the surface for dolphins and whales. 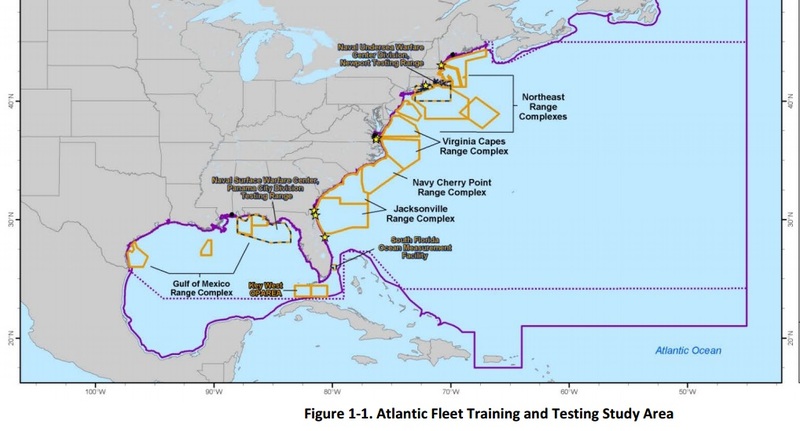 Service (NMFS) are issuing regulations under the Marine Mammal Protection Act to govern the unintentional taking of marine mammals incidental to training and testing activities conducted in the Atlantic Fleet Training and Testing (AFTT) Study Area from November 2013 through November 2018. 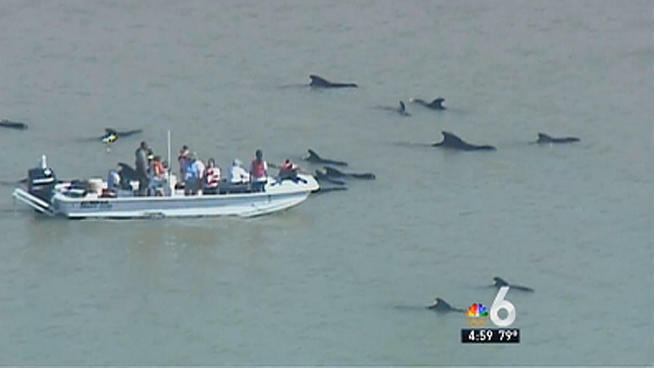 These regulations allow us to issue Letters of Authorization (LOA) for the incidental take of marine mammals during the Navy’s specified activities and timeframes, set forth the permissible methods of taking, set forth other means of effecting the least practicable adverse impact on marine mammal species or stocks and their habitat, and set forth requirements pertaining to the monitoring and reporting of the incidental take. While National Security is important to all American’s when is the price too great to the ocean and ocean life such as the pilot whale who is actually a dolphin, highly evolved and intelligent? We must question whether we have the right to take their lives in the name of training for war. Our voice is their only hope. As ocean advocates we must stand up and speak up and out for the dolphins, whales and all the ocean life that is going to be impacted by the Navy’s ever increasing war games in the oceans. We must demand transparency, we must demand acoustic necropsy and access to those results. The global community has a right to speak up for the whales and dolphins. Whalers and the captive industry are constantly being reminded by activists that they do not in fact own the whales and the dolphins that inhabit the oceans. Surely we must have the same voice in speaking out against the Navy and their ever increasing training exercises and war games that have the capacity to clear cut our oceans of whales, dolphins and many other species of ocean life. 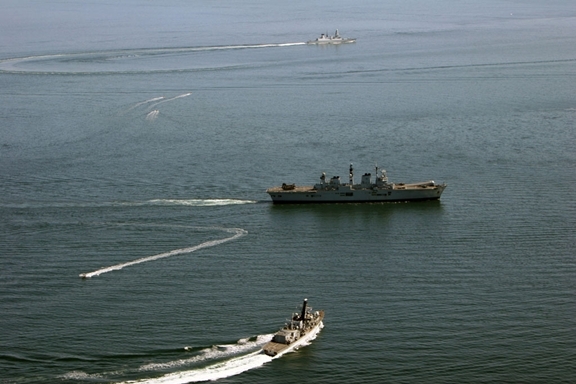 The military is calling their multinational Naval exercises a success: “A giant exercise off the coast of Scotland which involved more than 30 warships and 65 aircraft from 13 European countries has drawn to a close”. During their exercises the Navy tried to recreate war-time situations through the use of sonar, underwater detonations, and other tactical maneuvers. 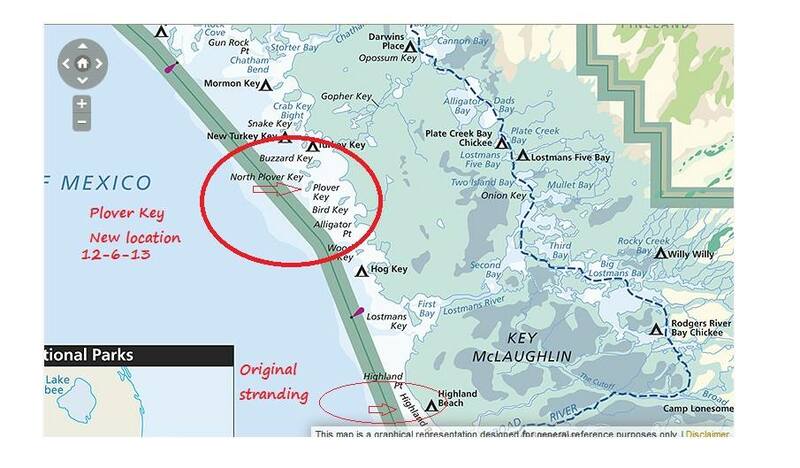 On April 25, 2013 three pilot whales stranded near Portmahomack, Easter Ross. 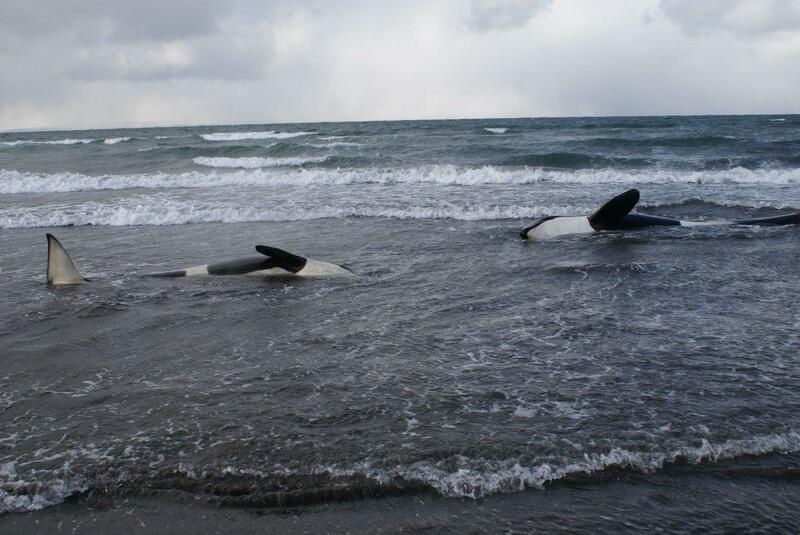 The stranding was immediately connected to the military operations forcing the exercise to move, “Bosses behind the biggest military exercise in Europe were forced to relocate their operation after three whales became stranded on a Scots beach” (source) Sadly the Navy’s change of location would be too late for the three pilot whales, one of which died. 2) The use of sonar in each submarine, and warship could have been used anywhere and at anytime. It’s use is not exclusive to exercises. 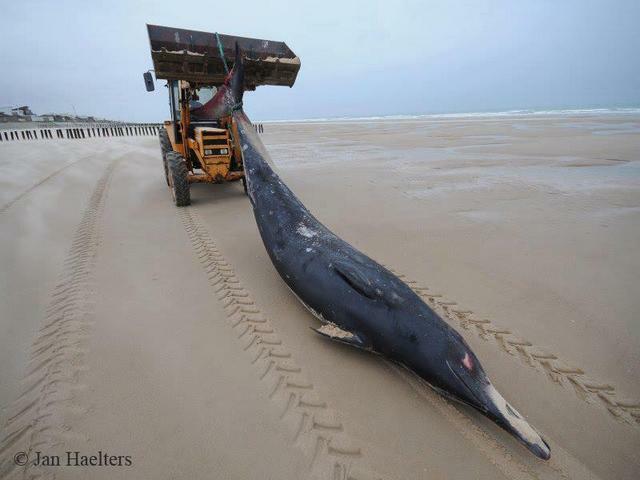 The information connecting cetacean strandings is always difficult to obtain but don’t we as citizens of the world and advocates for cetaceans and the ocean have a responsibility take action for the dolphins and whales who need our help so desperately. 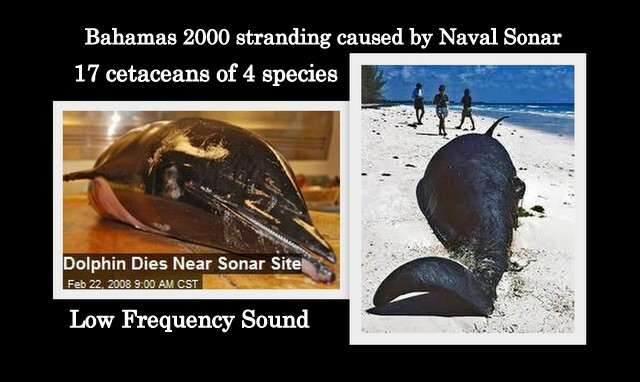 Sonar and seismic testing are deadly to cetaceans. Isn’t it time we started questioning it’s use worldwide. When does the price for war games played in the ocean become too great? Read an updated article that connects all the dots and lists additional deaths! 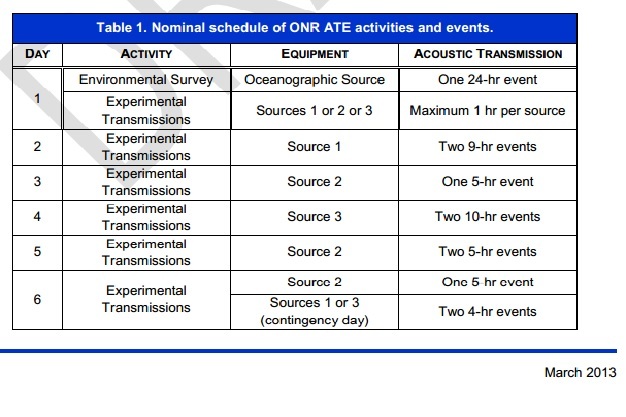 If the permit to perform this ATE sea life,whales and dolphins living in an already challenging Western North Pacific Ocean riddled with long line fishing, trawlers, hunting, shipping strikes and shipping noise will be exposed to 220 dB for extended periods of time as seen in the chart above. 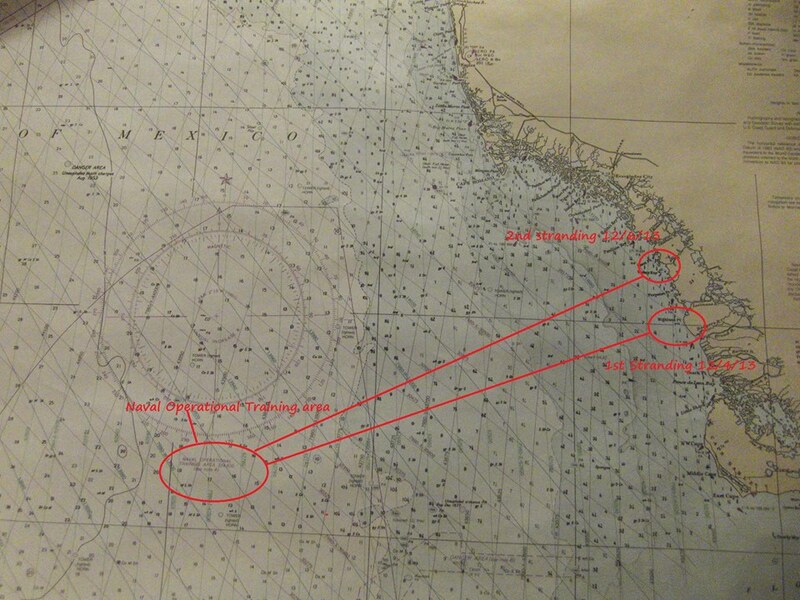 Navy sonar recorded 2003 in the Puget Sound. Join the voice of opposition to the use of Naval Sonar and all acoustic devices in the oceans. Please leave a comment asking NOAA/NMFS to deny the Navy’s request for a permit to do acoustic experiments in the North Pacific. The comment period on this permit ends on May 2, 2013 so get your comment in today! Comments on the application should be addressed to P. Michael Payne, Chief, Permits and Conservation Division, Office of Protected Resources, National Marine Fisheries Service, 1315 East-West Highway, Silver Spring, MD 20910. 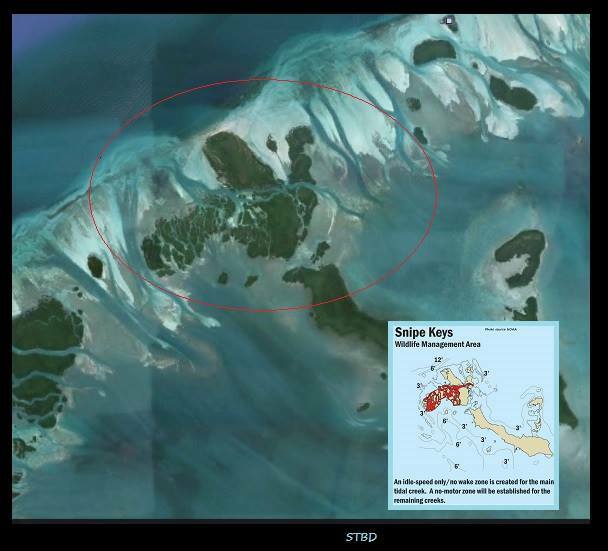 The mailbox address for providing email comments is ITP.Magliocca@noaa.gov. Read the entire permit proposal here. Follow the permits as they are listed here. 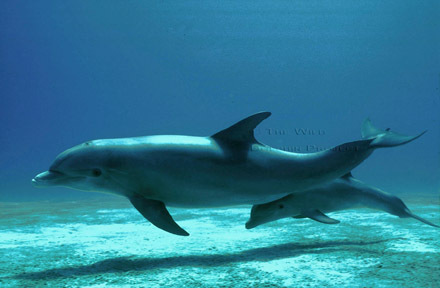 Dolphin death linked to Naval Sonar exercises off the coast of San Diego,Ca. 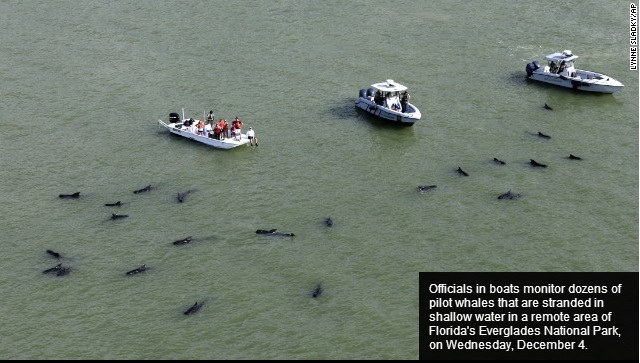 2008/In 2000, 17 whales stranded on beaches in the Bahamas following U.S. Navy sonar exercises. Beaked whales appear to be especially sensitive to sonar. 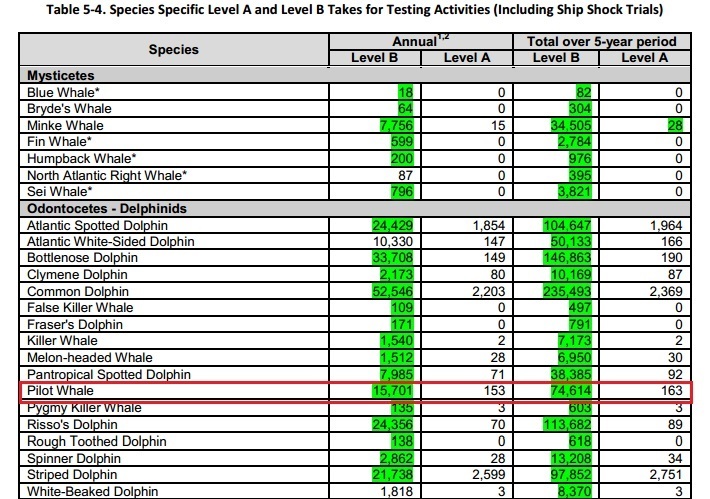 If the U.S. Navy is awarded two permits to “take” 31 million whales and dolphins over the next five years the results will be devastating to whales, dolphins, seals and all marine life off the Atlantic Coastline, Hawaii and Southern California Coastlines. The comment period on these two permits closes on March 11, 2013. Both permits are still up for review. Follow these links to see the permits and submit your comments. How many more must die for war games! 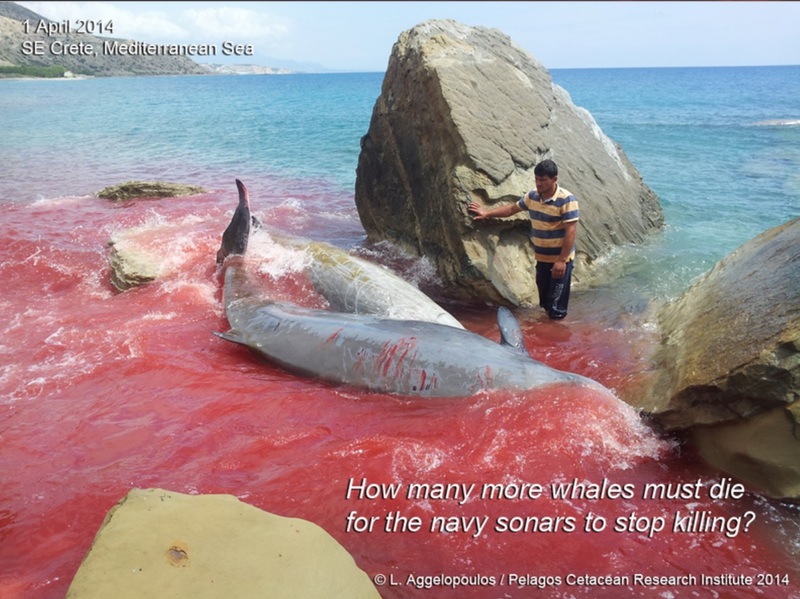 A sample letter and suggestions have been provided by Stephen Hambrick creator of the Facebook Event: Save Whales & Dolphins from Navy Sonar Massacre! 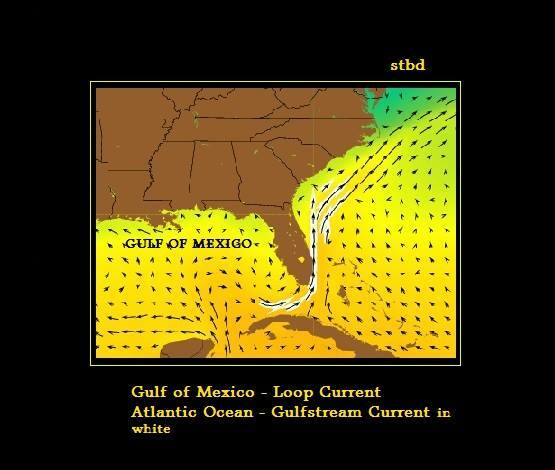 Please enter your comments regarding the Navy sonar testing. Tell them the potential casualty rate of Marine Mammals is unacceptable. The following are all very good examples, however it is not necessary to leave a lengthy Comment. a) The loss of marine life is too great, the oceans with all the vastly diversified free-roaming life of Cetaceans, together with all the other life forms contained within them are not owned or vested to the determination of the USA. Request the application by the US Navy be denied. 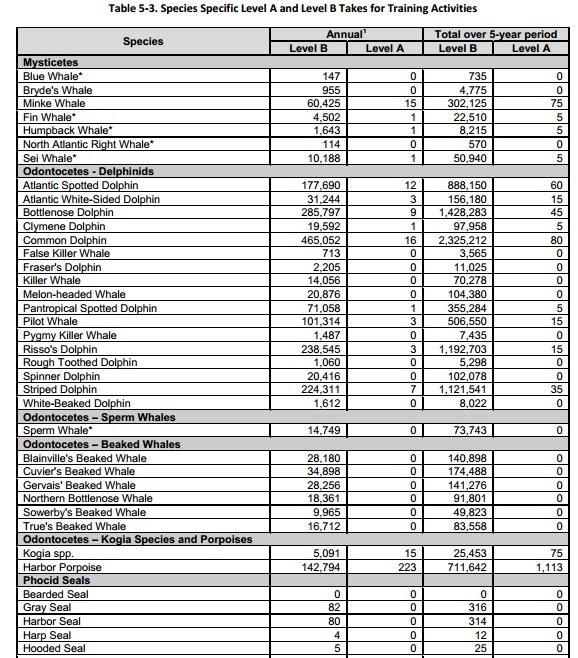 The numbers of marine mammals the Navy plans to harm, harass, and kill are catastrophic in impact to all the species specified. 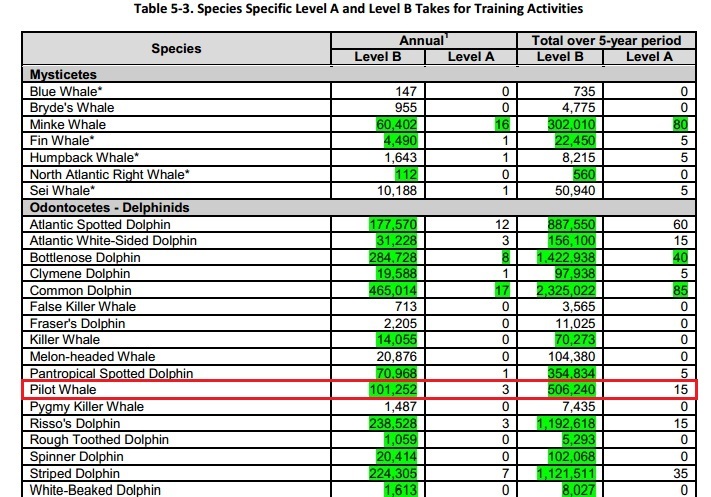 It is without precedent to slaughter, maim, otherwise harm cetaceans and other sea life on this scale. Request the application by the US Navy be denied. c) This permit seeks to fundamentally effect the balance of the worlds oceans and it’s natural habit I wish therefore to demand that you do not award the navy this permit, which seeks to commit devastation which will have consequences well beyond the the USA oceanic jurisdiction. Request the application by the US Navy be denied. e) By the Navy’s own admission, per their application. The Navy requests authorization to take individuals in a total of 74 marine mammal species and another 27 more marine mammals, with serious injury or mortality. 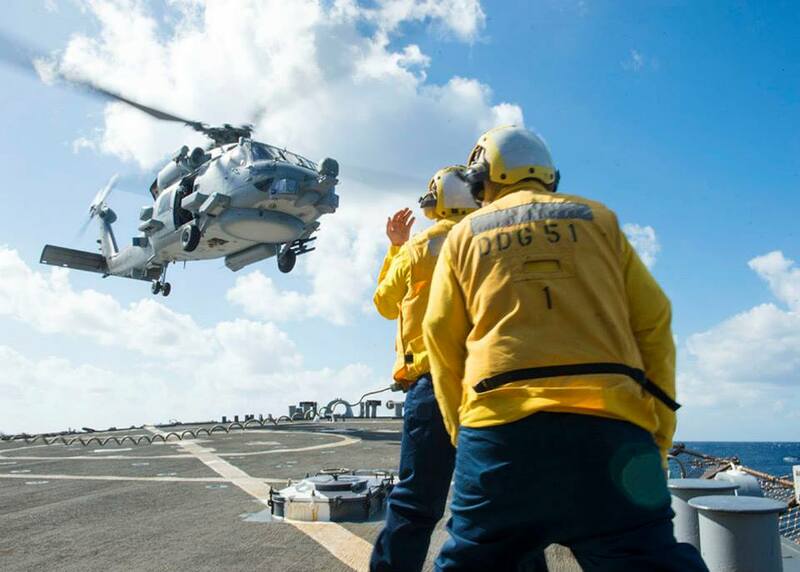 While I appreciate the Navy’s ability to defend and protect, the training and exercises should not be at the expense of the life of our oceans. For without our oceans. We have no life! A panel of leading marine scientists brought together in Oxford in 2011 by the International Programme on the State of the Ocean (IPSO) and the International Union for the Conservation of Nature (IUCN).The suggestion made by the panel is that the potential extinction of species, from large fish to tiny corals, is directly comparable to the five great mass extinctions in the geological record, during each of which much of the world’s life died out. The panel of 27 scientists, who considered the latest research from all areas of marine science, concluded that a “combination of stressors is creating the conditions associated with every previous major extinction of species in Earth’s history”. They also concluded:The speed and rate of degeneration of the oceans is far faster than anyone has predicted; Many of the negative impacts identified are greater than the worst predictions; The first steps to globally significant extinction may have already begun. Dr Alex Rogers, professor of conservation biology at Oxford University and IPSO’s scientific director states: “As we considered the cumulative effect of what humankind does to the oceans, the implications became far worse than we had realized.This is a very serious situation demanding action at every level. We are looking at consequences for humankind that will impact in our lifetime, and worse, in the lifetime of our children and generations beyond that.” Given the state of our oceans at this time, allowing these tests seems to be far beyond a ‘negligible impact’. Therefore I request the application of the US Navy be denied. The US Navy can kill, maim, and harass 7,956 whales and 100K dolphins per year. Tell the Dept. 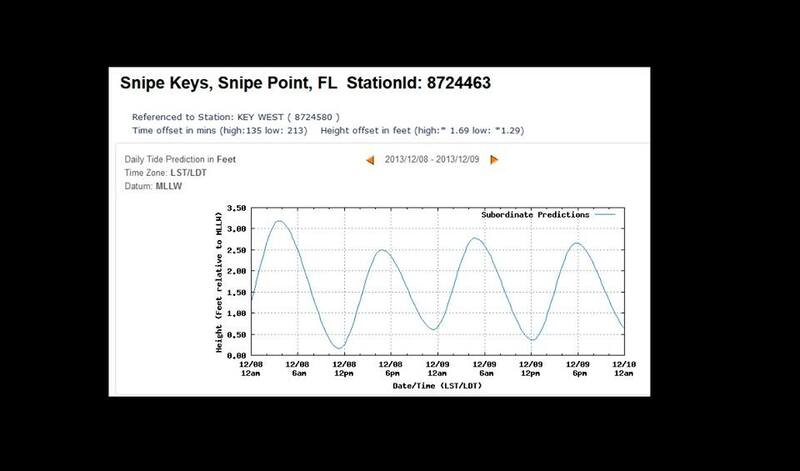 of Fisheries/NOAA to stop issuing permits for this slaughter! 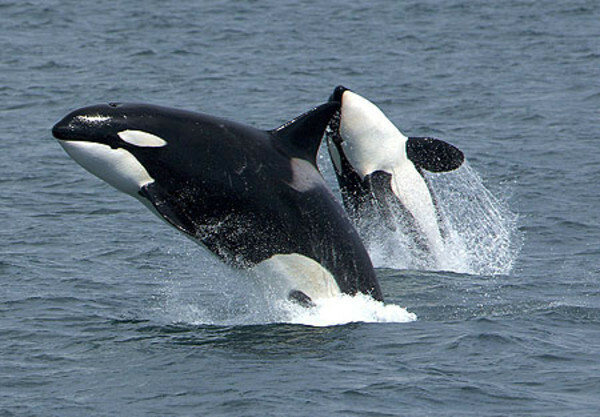 Protect Constituents Rights of Appeal on NOAA Marine Mammal Permit Applications. HELP STOP THE NAVY’S ASSAULT ON WHALES! These numbers are unacceptable! All ocean activists need to make comments and let our voices be heard. Only we can stop the Navy from decimating whale and dolphin populations. Please follow this link and make your comment. The comment period ends on 11/05/2012. 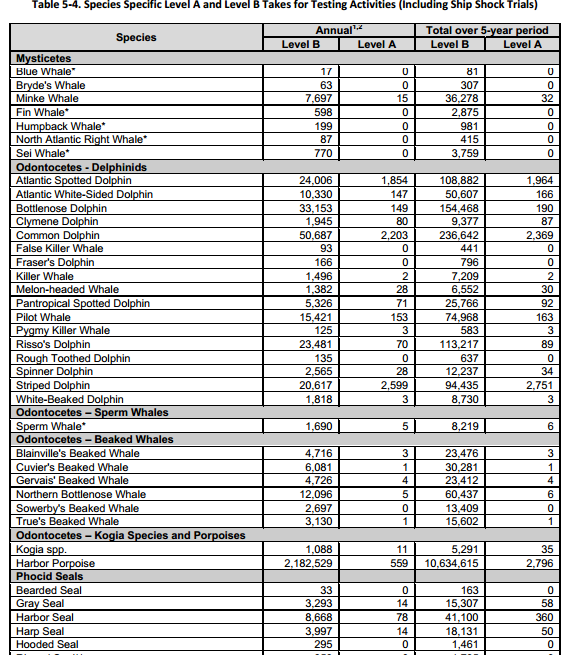 We must convince NMFS/NOAA that these incidental take numbers are unacceptable!